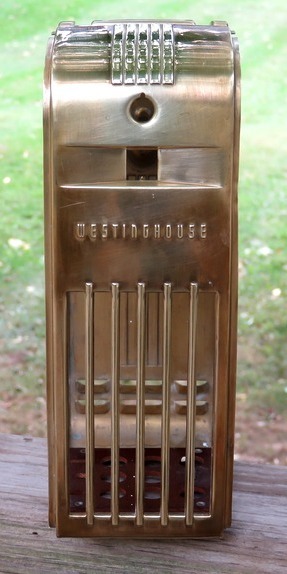 Westinghouse model H-126 "Little Jewel"
Let's start making this radio presentable. It's the end of September, 2017. At this time of year in south-eastern Pennsylvania the weather can change drastically. This morning I had my winter coat on. Now I'm wearing shorts. I can't use spray paint inside the house. If I don't get the radio painted soon I'll have to wait until May. Once it gets cool and breezy and all kinds of stuff starts falling off the trees and blowing around, you can just forget about painting anything like this outside. 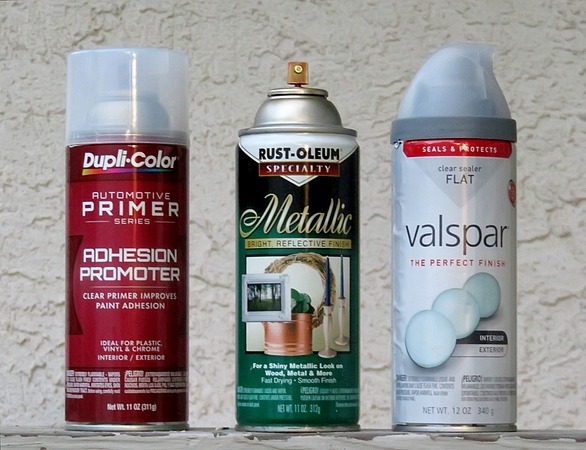 I'm using Rust-Oleum "PAINT+PRIMER" to save time. 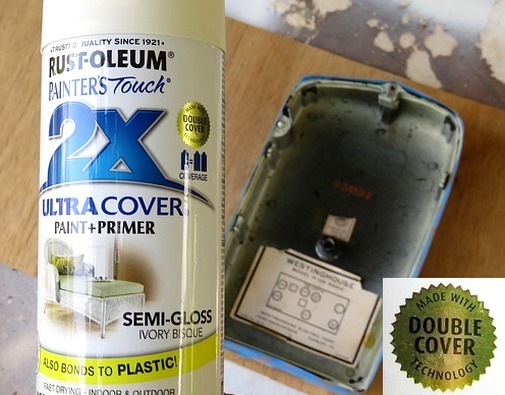 Since I have to paint two covers, I bought "double cover" paint. The color is "Ivory Bisque." I had to look up the word "Bisque." Bisque is a type of soup. Ivory soup. 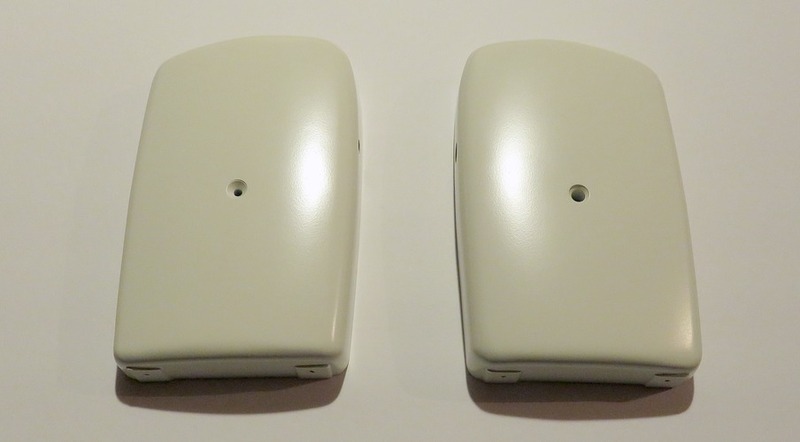 The Bakelite shells have been wet sanded with 220, then 400, then 800 grit sandpaper. 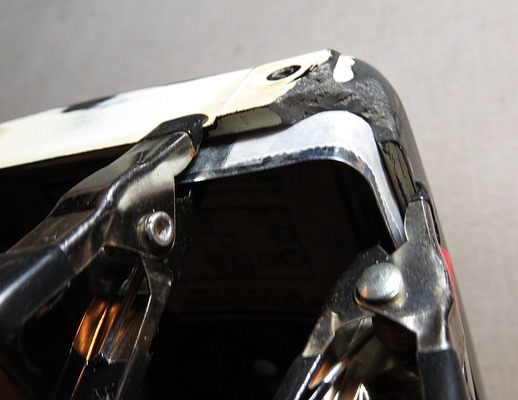 The crack in the top of the broken shell has been reinforced with J-B Weld "KwikWeld" and nylon screen. 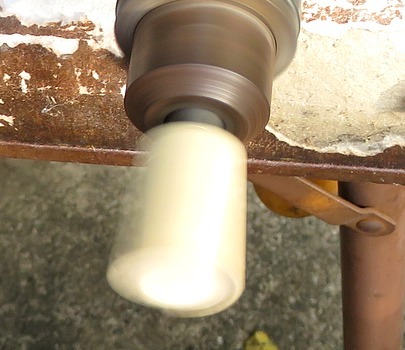 The missing chunk in the bottom has been filled in with KwikWeld, then sanded to match the original contour. KwikWeld sets in 6 minutes, so it is perfect for this. There are three globs of KwikWeld in the right-hand photo, one on top of the other. To match the inside contour I used a small piece of roof flashing with wax paper taped to it. J-B Weld will not adhere to the wax paper. The repair is almost completely invisible. There are three tiny dots in it, but since it's on the bottom I don't care. Here are the painted shells. After the paint cured for three weeks, they got a coat of automobile paste wax. 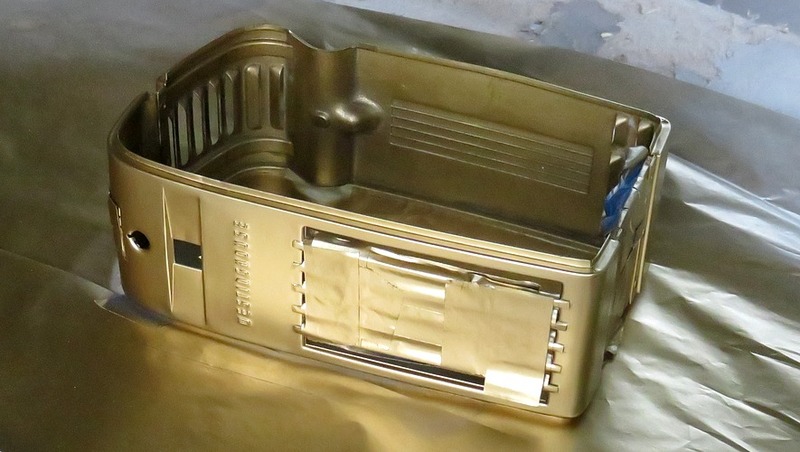 Now it's time to paint the metal part. Should it be stripped down to the brass? According to the ad on the left from the Saturday Evening Post, November 1946, it says it is "gold finish metal." What does that mean? 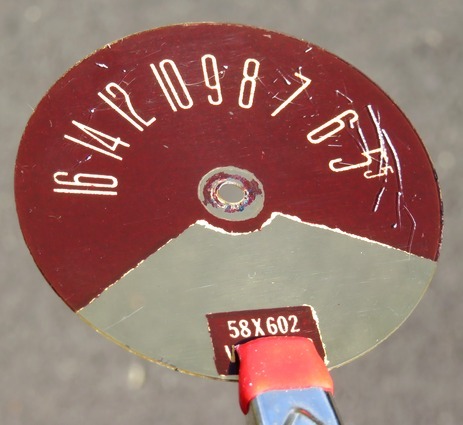 "Glasslinger" on YouTube says that what you see on the radio today is "discolored lacquer." Is it clear lacquer? 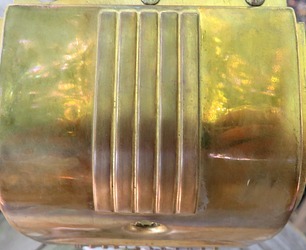 On the right is an example of the radio stripped down to the bare brass. Someone who has a lot more skill than I have painted it. Notice in the drawing on the left how the radio is being supported on the bottom. Is that to prevent the handle from breaking off? 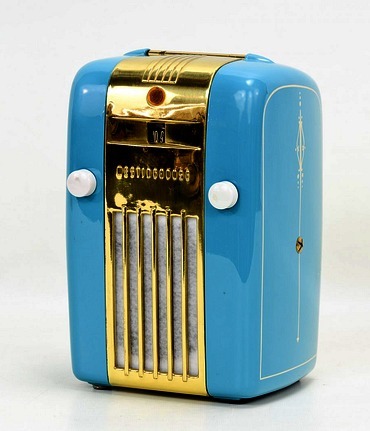 The radio was painted with gold lacquer by Westinghouse. It's not a clear coat on bare brass. 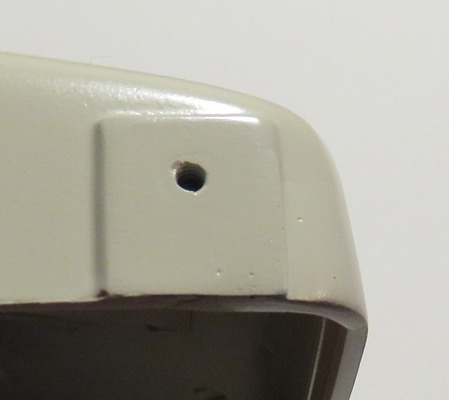 You can see where it has chipped off the handle and you can tell by the rivets on the bottom that the finish is original. When I stripped the brass with paint remover, "gold" came off in blobs. 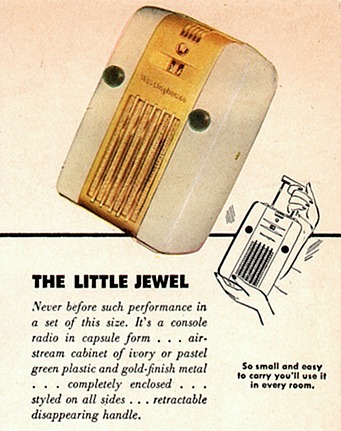 So there is the answer to anyone who has wondered what that awful greenish-hued coating is on these old "Little Jewel" radios. It's gold lacquer from the 1940s. It held up pretty well if you ask me. 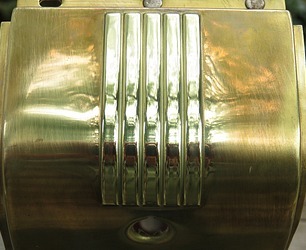 The brass after paint remover was used on it and then buffed with steel wool. This was the easiest part of the entire operation. The paint remover was cleaned off with a blast from the garden hose! Steel wool and polish on the shiny bits made a huge difference. Now they need to be clear coated so they don't oxidize. 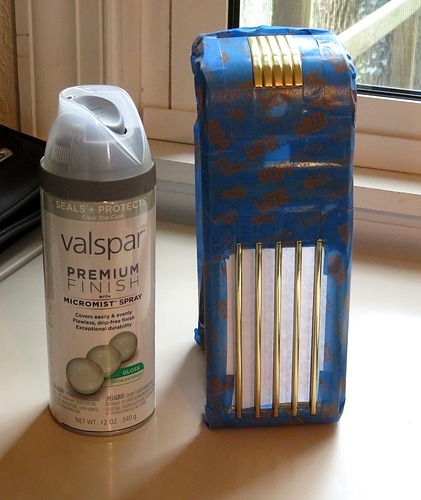 To paint the rest of the brass, I'm using clear primer, some gold paint I found in the basement and a flat clear coat. The shiny parts now had to be masked. 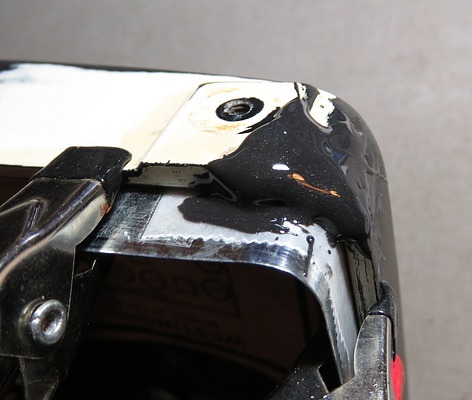 When you're masking small parts, the tape seems to become very thick and hard to work with. There is probably a better tape to use instead of "painters tape" which works great on woodwork or a window, but not so well here. On the far left you can see that it has lifted. 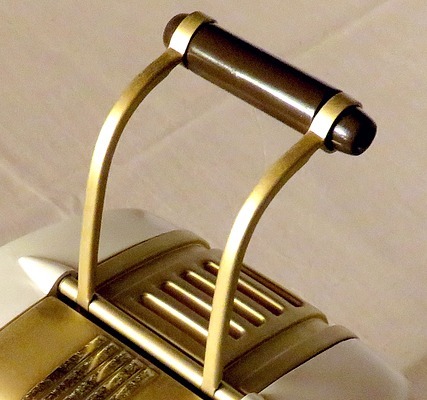 That part had to be polished again to remove the gold paint. The dial had holes in the paint that made "stars" when it was backlit. Notice that when it is backlit the numbers are gold. 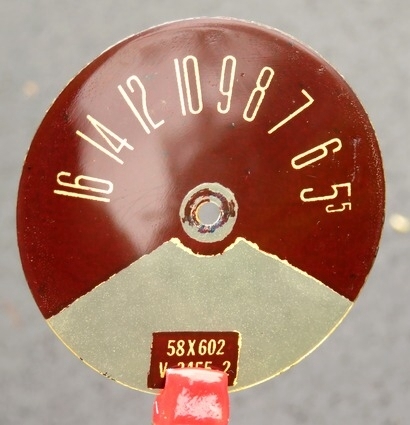 After cleaning the dial, it was obvious that the scratches on the front were never going to come out. I noticed that when it was wet they almost disappeared. 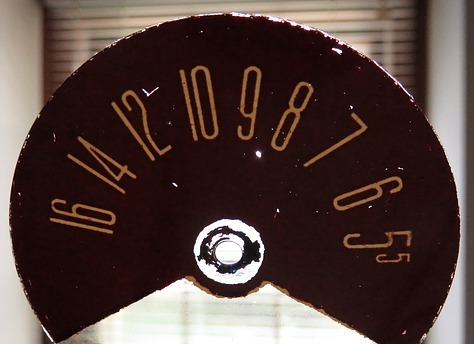 I thought of putting mineral oil on it, but the heat from the six vacuum tubes would probably evaporate it. Andrea suggested a clear coat then filling in the stars from the back of the dial with a black marker. On the right is the dial after a clear coat and some sanding and polishing. Considering that it was toast, I think it came out pretty well. 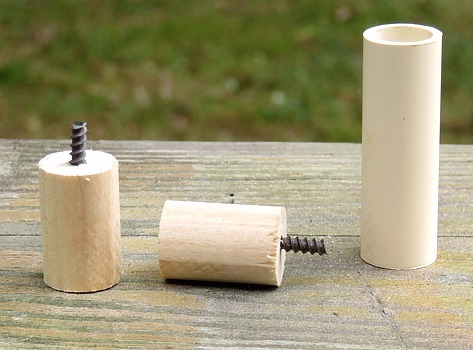 To make a handle I bought some 1/2" PVC pipe and a poplar dowel. 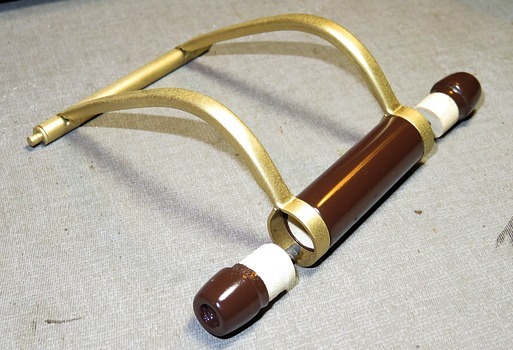 The brass part of the handle is pretty much inflexible, so the handle would have to be made in three pieces and inserted into the brass. 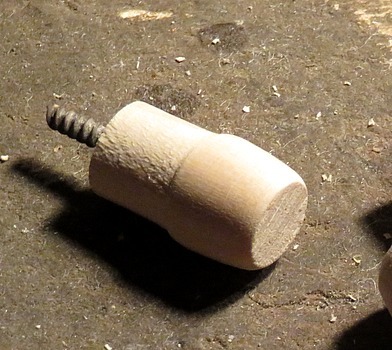 The idea was to put screws into the dowel parts, spin them in a drill and sand them down. 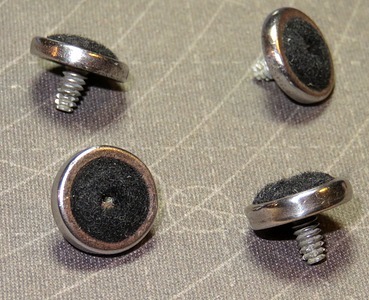 I don't have a drill press and it was impossible to either center the hole for the screw or make it plumb. They wobbled like mad in the drill chuck. 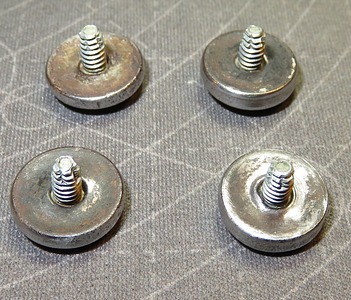 After several attempts I managed to get two that were passable, then the parts were spray painted and polished. I have enough stuff left over to make 20 more handles! The feet were covered with rust on the bottom and sides. I was able to get most of it off but any indication of what color they were was gone. 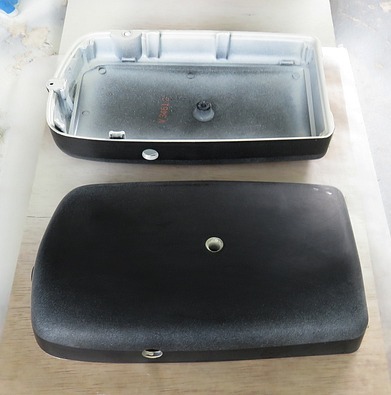 The backs were no help; what was left of the paint was just a dull gray coating. I was going to paint them brown to match the handle. Somebody knocked over a cup of coffee in the 1950s. It went under the radio and when they cleaned up the coffee they didn't wipe off the feet. Thanks, Mom. What's that? Your husband was a Marine fighting in Korea and you heard on this very radio that 30,000 of our frozen and starving Marines were encircled by 120,000 Red Chinese at the Chosin Reservoir? And your coffee cup dropped out of your hand? Fine! I'll clean off the rust. The things I have to deal with! I found this picture on the Internet. They seem to be gold! That makes sense. Here's another one where they sort of look gold. So I painted them gold. After I painted them I started to reconsider. I think the feet are silver and there is some rust on the ones that appear gold. Oh well, I can tell people, "The radio was going to be married but it got gold feet!" Why was this radio in such sad shape, with no handle, cracked case, rusty feet and scratched dial? It's because I didn't find it in Grandpop's house, it was found in a trash can, and it was 40 years old when it was thrown away. It wouldn't exist today except for a chance encounter while walking down the street 30 years ago. Whatever the outward condition, it can be made to play like it did when it was new. At least it has that much going for it.